Dr Sarah Perkins, Director of GW4, highlighted how GW4’s world class research and innovation strengths can support UKRI’s strategic vision and the Industrial Strategy in tackling major global and industrial challenges at the Universities UK conference. Dr Perkins was invited to present at the Universities UK’s Research & Innovation in Higher Education conference on Tuesday 16 October 2018 at Woburn House in London. Dr Perkins took part in a regional networks panel discussing the importance of place-based research, university-business collaborations and local engagement, alongside representatives from N8, White Rose University Consortium and Eastern Arc. The research infrastructure and landscape in the UK is undergoing significant change and the role of higher education institutions in research, innovation and the industrial strategy is expanding and shifting. Dr Perkins said: “The conference provided a great opportunity to showcase GW4’s research and innovation strengths. The GW4 Alliance provides a unique opportunity for UKRI to efficiently access four world-class research-intensive universities as we work together to navigate this new landscape”. 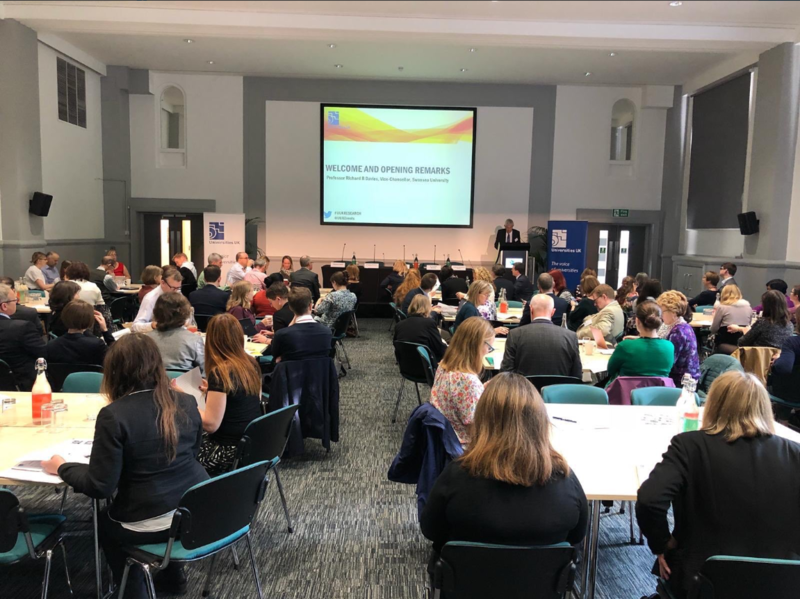 The conference allowed speakers and delegates to examine the changing research infrastructure and landscape, and to discuss issues and developments facing institutions and individual researchers, with speakers from government, funders and business.